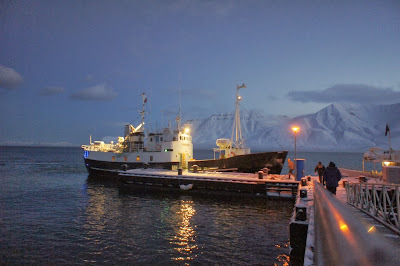 M/S Langøysund waiting four the students at 08:30 in Longyearbyen, ready for the trip to Pyramiden. The morning of the fourth day of the Space Weather Science Camp of a group of Finnish high-school students in Longyearbyen finally gave us the starry skies and clear weather. 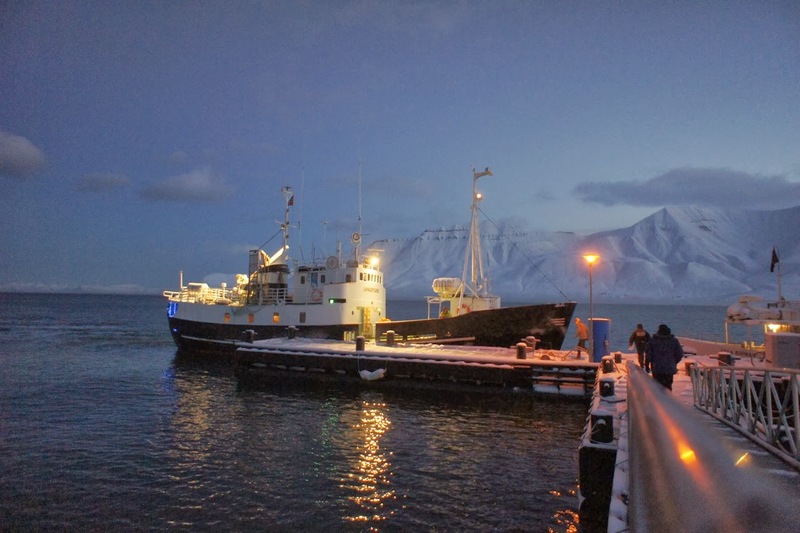 This, on Svalbard, means at least -15°C temperature and high chill factor with the ever blowing sea winds. The chill factor is particularly significant onboard a ship, such as the M/S Langøysund (photo above). This boat, with a staff of four, one of which is a very competent international guide speaking several languages, took us on a cultural visit to Pyramiden. Pyramiden, an abandoned ghost town at nearly 79° North. 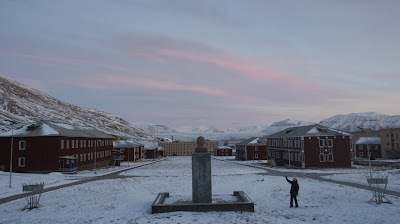 The main square of Pyramiden, view from the cultural house towards Nordenskiöldbreen. Established in 1910 by Sweden and sold to the Soviet Union in 1927, Pyramiden is an abandoned settlement at nearly 79° North, once a lively coal mining town of 900 people, including families. 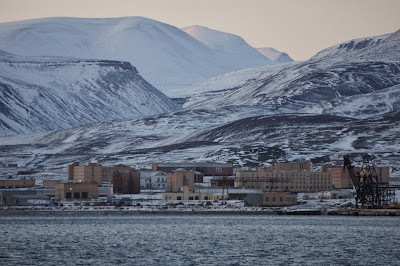 While Longyearbyen still in 1970's only was a town of a few male mining workers, Pyramiden had a swimming and sports facility, cultural house with indoor basket ball court, theater and cinema, hospital, farm animals, school and children play grounds. 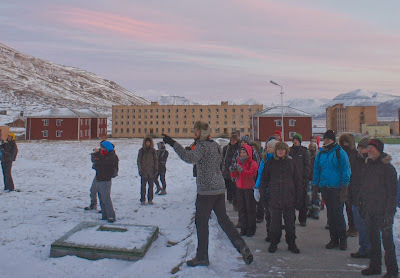 We got a comprehensive introduction to the history of Svalbard and Pyramiden during the trip. Note that the guide is carrying a rifle for safety. A polar bear was recently reported to be seen here. Luckily we did not see it. 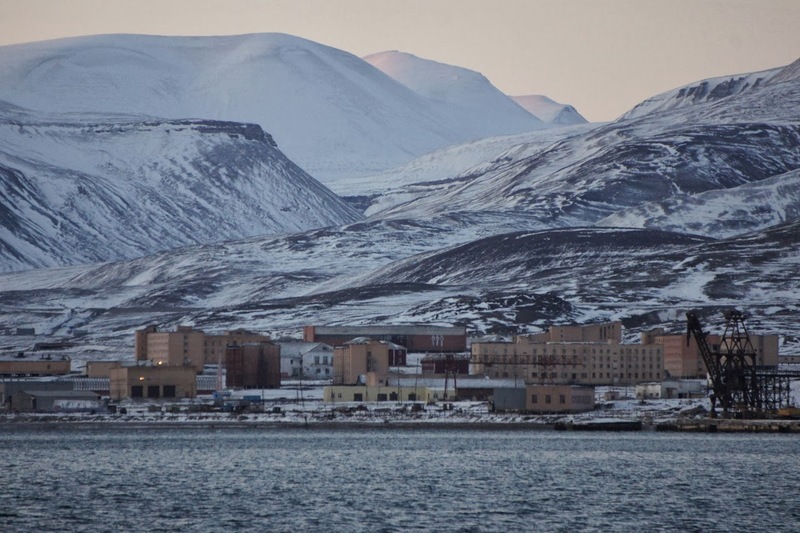 Today Pyramiden is inhabited normally by only two persons, and even they move away for winter. There is a hotel, which offers services during some tourist seasons and tourist visits are organised by boats from Longyerbyen. When the original inhabitants left the town in 1998, they only had 48 hours to collect their personal belongings and the whole town was emptied at once. The houses and rooms were left as they were. Today you can take a museum time trip to a complete small town of the Soviet Union time here. 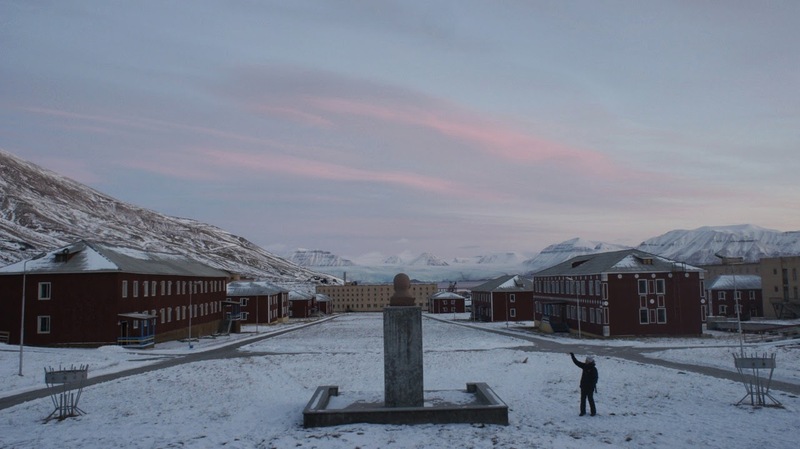 Some houses are even renovated, so that Pyramiden is slowly changing its face from a ghost town to a cultural heritage attraction in the far, far north. Discussing space physics on the front deck of M/S Langøysund. 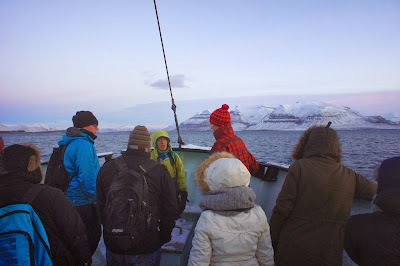 The boat trip itself was an extraordinary arctic experience. Lunch was served as barbecue on the front deck, despite of the wind and freezing temperature. Vegetarians got their own iceberg salad plates, hot omelettes, salmon and naturally a taste of grilled whale meat was available, too. As sun painted the morning sky with golden colors in the east, pastel shades were seen allover the rest of the sky, above the sharp and layered mountain peaks, which are characteristic to Svalbard. Nordenskiöldbreen, a glacier named after the famous Finnish-Swedish arctic explorer, who once was here, too. The ship brought us near to the glacier Nordenskiöldbreen for the lunch break. As extra surprise for 2 minutes we could admire the fins of a few whales as they swam away from the boat. At Pyramiden we saw typical arctic animals at a very near distance. Two ptarmigans were eating seeds by one street and an arctic fox was searching for food near to the hotel building. They seemed to belong to the current inhabitants of the town letting us to photograph them at 10 m distance.